NatureBoy had a couple of friend for a sleep-over last night. Given the Wii and DS excitement, the homemade pizza, and adolescent male I-haven’t-learned- to-use-deodorant tang, they have been having a good time. I had a really good time, too, because my friend Josh came over to run a one-on-one game of Exalted using his rules-light Challenge System. 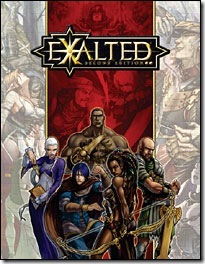 I’ve played a couple of games of Exalted with Josh and some other friends, both with the Exalted storyteller rules, and with the Wushu Exalted variant. Josh’s Challenge System worked well to give some structure to the situation resolution and narration. We told a story that would make good “pilot episode” for my character, Ju-Fei. We established his background as a decadent young merchant noble, covered his exaltation, the transfiguration of his longtime friend into a probable nemesis, and concluded with his setting out from Nexus in a familiar direction but with an unknown destination (walking off into the sunrise). I’m hopeful that the story may continue at some point, and maybe we’ll get another player or two into the game. Josh is an excellent storyteller; his descriptions are rich, his characters nuanced, and his storylines cohesive and compelling. I hope my characters are a good fit. This entry was posted in Gaming and tagged friends, Gaming on March 1, 2009 by Geoff.